With Copenhagen now over, I’ve been wondering how, briefly, to capture here in words and an appropriate image my own increasingly clear understanding, which the climate summit has served only to reinforce, that the game is over. The image I alighted on is perhaps a little subtle, rediscovered among thousands of old negatives I’m now scanning into digital format. It reminds me how my own awareness has changed since I took the photograph on a cross-country skiing trip outside Moscow when a student there 40 years ago. 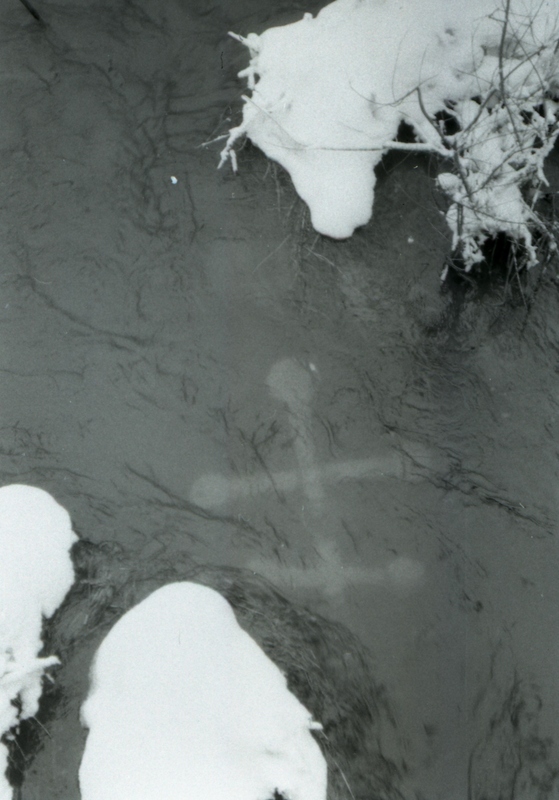 Look carefully, and you’ll see a Russian Orthodox church cross cast into a snow-rimmed stream – reflecting youthful vandalism, perhaps, but more probably systemic communist-era contempt for a rich, complex spiritual past. Whoever cast that cross into the stream just didn’t connect, didn’t take responsibility, didn’t want to know. It’s not about religion, but it is about care for our heritage and the world that has given us birth, warmth and sustenance. And of course it’s also a reminder of times when winters were magnificent and real, with temperatures in Moscow regularly falling to well below -20C, and of an era of naive blindness as to where the 20th century’s economic and political models were taking us. That direction is now so much more urgently clear than it was, and reflecting on Copenhagen, I find myself agreeing with Open Democracy’s Simon Zadek, that it’s time to find alternative ways forward. COP15’s greatest contribution to the public good, writes Zadek, may be to bury, once and for all, our outmoded ways of doing global governance. Such an achievement, whilst sad to contemplate today, may turn out in tomorrow’s history to be an extraodinarily important legacy that served us and our children well in decades to come. As I watch, and join, Christmas shoppers here in the Cotswolds continuing to buy and to consume obscene quantities of food and of presents, encouraged by government and media to keep shopping and borrowing to rebuild the economy, I’m afraid that while I concur that Copenhagen will be seen by history as a turning point, I don’t share Zadek’s implied optimism for future generations. Our friend and ocean-rower Roz Savage, still relatively fresh from her summer journey from Hawaii to Kiribati in the Pacific, is staying with us today on her own return from Copenhagen, and is almost as gloomy as we are. Perhaps it’s partly our own realism (I bridle when being dubbed a pessimist) rubbing off on her. But her sense of profoundly being let down does seem echoed in much of the comment, public and personal, coming out of Copenhagen, where one senior diplomat I know emailed to say how he came away from the summit dazed and bedraggled – and particularly affected by a comment from an influential French thinker in the New York Times this week, recalling the Russian author Andrei Bely’s description of Russia’s early 20th century mood as revolution and war loomed. Events here are coming to a boiling point, wrote Bely. All of Russia is on fire. The fire is spreading everywhere. The anguish of the soul and sadness of the individual have fused with national mourning to produce one massive scarlet horror. The horror that is now coming on a global scale is, to me, beyond question. What’s less clear, visible or even comprehensible, is what shape it will take, how it will begin, how we – humanity collectively – will know that it has truly started, and when our collective alarms will seriously begin to sound. We probably have a few years to go until people begin to panic. But when I think back to two years ago, when I wrote a cover article on the psychology of climate change for Therapy Today, a great deal has changed and continues to shift. In terms of quantity, television, radio and the newspapers in Britain at least are now awash with reports and discussions of climate change, partly but not only because of Copenhagen. But I continue to be amazed how far the quality of alarm lags behind, with journalists and politicians remaining supremely reluctant – fearful, perhaps – to join up the dots and speak directly of what is happening. Post-Copenhagen, 2010 will be a critical year.